the park by Monday or be evicted. 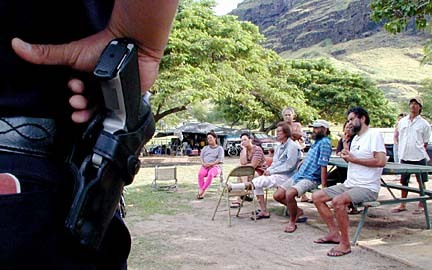 Some of the 35 or so families living at Keaau Beach Park in Waianae said they will remain there past this weekend and face possible arrest. "I'm not going anywhere," said Sterling Mahelona, 32. "I'll just take it day by day. If Christmas is in jail, so be it." Starting tomorrow, the families will be cited by police for illegal camping, and those who remain will be removed on Monday, said city Parks Director Bill Balfour Jr. The city has set 8 a.m. tomorrow as the deadline to leave, part of an agreement which had, since April, allowed the homeless to stay without restrictions. Balfour said he expects those on the beach to honor the agreement. "If they say they're going to leave, we'll monitor them to make sure they do leave," Balfour said. "We'll be monitoring them Wednesday, Thursday and Friday. Monday morning, those who have not been moved will have to be removed." tent city by Monday, or they will be moved out. Families today asked Balfour for an extension until January so they would not have to face the holidays with the burden of relocating. Balfour, who went to the beach this morning, said the decision is not his to make. Some of the campers said they would leave. But one of them, Donna Tinoga, said others feel they need to make a statement "being that it's Christmas, they have to have some compassion for us. (But) I guess we're all going to get arrested." David Rosa, 51, said he's not sure what his family's decision will be. "This weekend we're going to do a lot of heavy thought about what we're going to do." Rosa said he, his wife and his 21-year-old mentally handicapped child likely will move to the side of the road. If the families come back after leaving, they will need to follow city regulations requiring them, like other campers, to apply for weekly permits. They then would need to break down their camps on Wednesdays and Thursdays and seek shelter elsewhere on those days. An unidentified woman's disappointment shows. The park will be shut down from Monday through Dec. 10 for inventory and repairs, Balfour said. The city has done what it can to try to place the families, and nearly all of those remaining are doing so on their own, he said. Stanlyn Placencia, coordinator for Waianae Community Outreach, a coalition of Leeward Coast social service agencies, said some families will move out on their own. 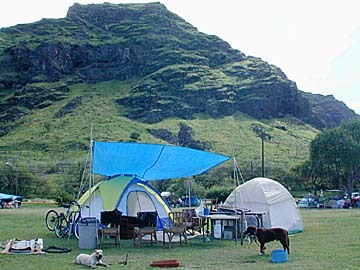 Some may end up getting camping permits for other beaches, such as Nanakuli Beach Park. And then, Placencia said, "there are going to be other families who are going to rebel, and who want confrontation." She said some have torn up informational fliers in front of social service workers who were handing them out. Placencia, whose group has worked for months to find housing for as many families as possible, said she has mixed feelings about removing them from the beach. "On the other side, I'm a social services provider and asking, 'Oh, what are some of these people going to do?' " she said. There were 17 families identified on the beach when Placencia's group hashed out its agreement with Balfour in April. Of those, 10 have found shelter, while the rest remain. Meanwhile, taking advantage of the agreement at Keaau, between 20 and 30 other homeless families have moved into the beach park.